Accidental death due to drowning whilst bathing. Frank Bradbury was born in Smethwick, Staffordshire in 1888. His parents were Samuel and Elizabeth Bradbury – his father served as a police constable until his untimely death in 1908 at the age of 45. Frank had an older brother named William and younger sisters Carrie, Ethel and Eva. Little is known about Frank’s early life in Staffordshire. However by 1911 he was living on the Rhug estate near Corwen and working as a footman to the Wynn family – Mrs Wynn being head of the household. The census describes him as one of two footmen. There were several other servants in the house, including a butler. Frank’s mother, Carrie (19) and Eva (9) were all living in Piercy Street, Wednesbury at the time. On the 1st of October 1913 Frank married Margaret Sarah Roberts of Hillside, Cwm. Their wedding took place in Cwm Parish Church. (Cwm is a small hamlet situated approximately a mile and a half from Dyserth.) Soon they became parents – Curzon Samuel Bradbury was born in Cwm on the 11th of January 1914. Frank joined up in Blackburn on the 28th of September 1915 and served for 2 years with the 19th Company, Royal Army Medical Corps. His enlistment papers give the following information about him. He was 26 years and 6 months old, 5ft 8inches tall, a butler by trade and living at 161 Derby Street, Bolton. His unmarried sister Ethel lived at the same address. Frank was not fully fit to serve overseas as he had a “slight defect but not sufficient to cause rejection”. The medical officer at Queen Mary’s Military Hospital, Whalley, passed him fit “for home hospital reserve only”. During this time he and Margaret had another son: Frank Robert Bradbury was born in Cwm on the 16th of April 1916. 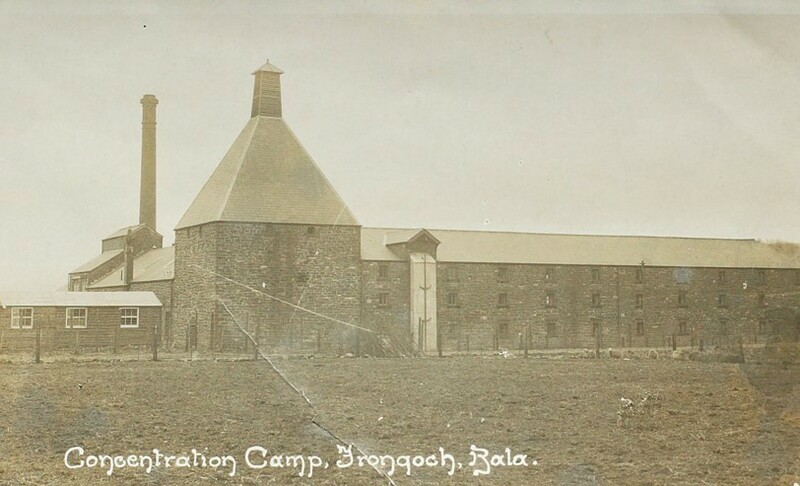 Frank was stationed at Frongoch Camp near Bala. Originally Frongoch had been a distillery but following its closure in 1910, at the beginning of WW1 it became a makeshift internment camp. Until 1916 the abandoned distillery and associated huts housed German prisoners of war. In the wake of the 1916 Easter Rising in Dublin, the German prisoners were moved and it was used as a place of internment for approximately 1,800 Irish prisoners, among them Michael Collins and Arthur Griffith. They were accorded the status of prisoners of war. Another of the prisoners was the future Hollywood actor Arthur Shields. The camp became a fertile seeding ground for the spreading of the revolutionary gospel, with inspired organisers such as Michael Collins giving impromptu lessons in guerrilla tactics. Later the camp became known as ollscoil na réabhlóide, the “University of Revolution” or sometimes “Sinn Féin University”. 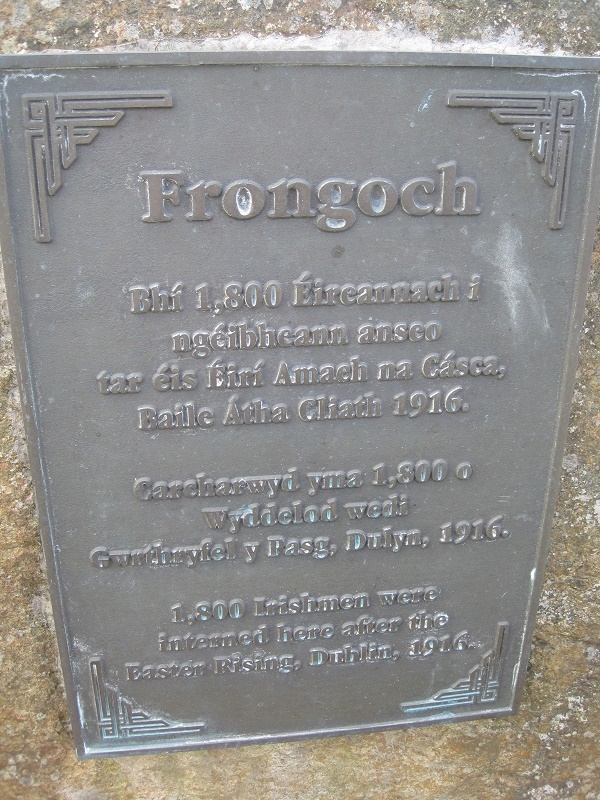 Thus Frongoch played an important part in the turbulent political history of Ireland. The Irish were dispersed elsewhere by December 1916 when David Lloyd George replaced H H Asquith as Prime Minister and the camp reverted to accommodate German POWs. Today the site of the former camp is occupied by the local primary school, Ysgol Bro Tryweryn. 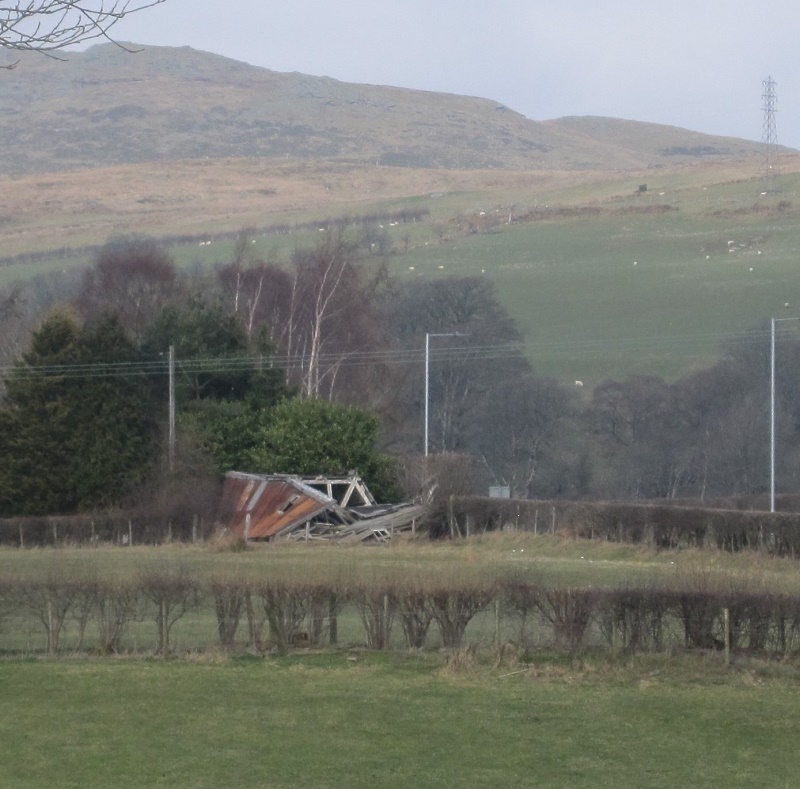 The remains of a solitary hut in the corner of a field are all that is left. A commemorative plaque stands nearby, with inscriptions in Irish, Welsh and English. 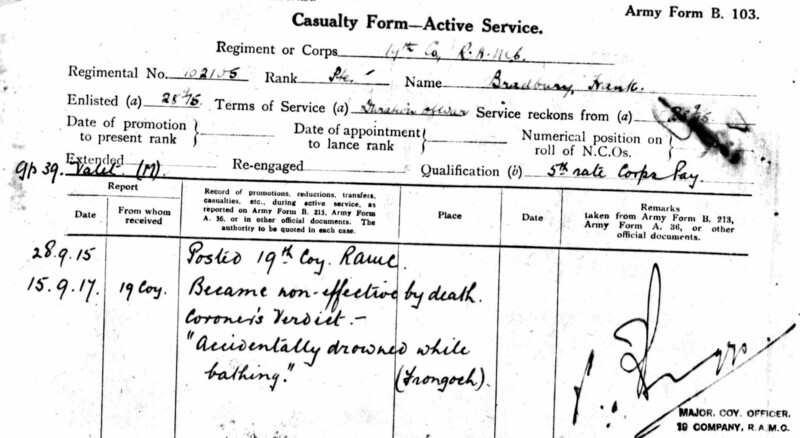 Sadly on the 15th of September 1917 and as the result of a tragic accident Frank Bradbury died whilst at Frongoch. 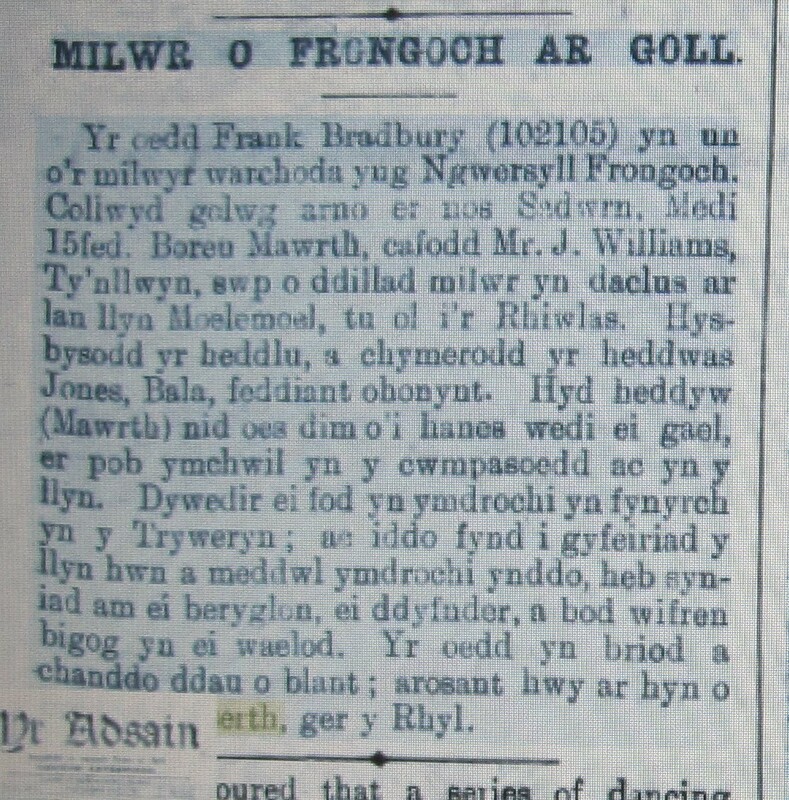 An account in Yr Adsain of “a soldier from Frongoch who had gone missing”. Frank’s body was conveyed by train from Bala and accompanied by Corporal Mitt and Private Partington who had identified him. He was buried with full military honours. Margaret Bradbury – the mother of two little boys – was now a widow. In April 1918 she was awarded an army pension of 22 shillings and 11 pence a week for her and her children. She stayed with members of her family in Lancashire after her husband’s death but made her home in Dyserth. Frank’s Roll of Honour card in the Flintshire Record Office was signed by Margaret Sarah and gives her address as Myrtle Cottage, The Hill, Dyserth. She went on to suffer a second terrible tragedy when her first born son Charles was killed at the beginning of the Second World War in 1939. 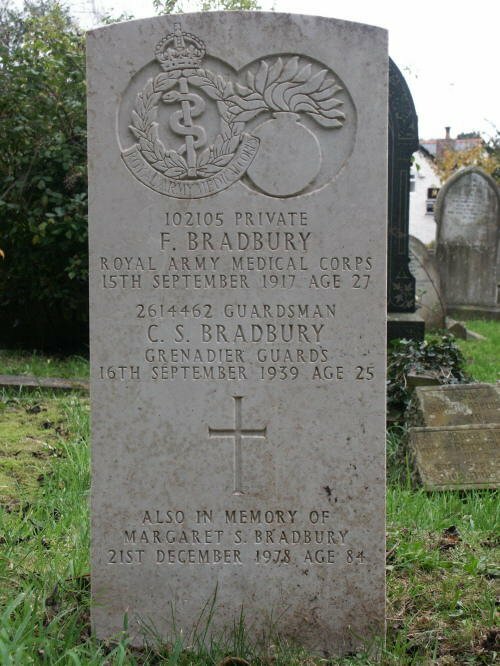 He was 25 years old and a guardsman in the Grenadier Guards. She lost both her husband and son. Margaret died forty years later aged 84 and is buried with Frank and Charles in Dyserth churchyard.